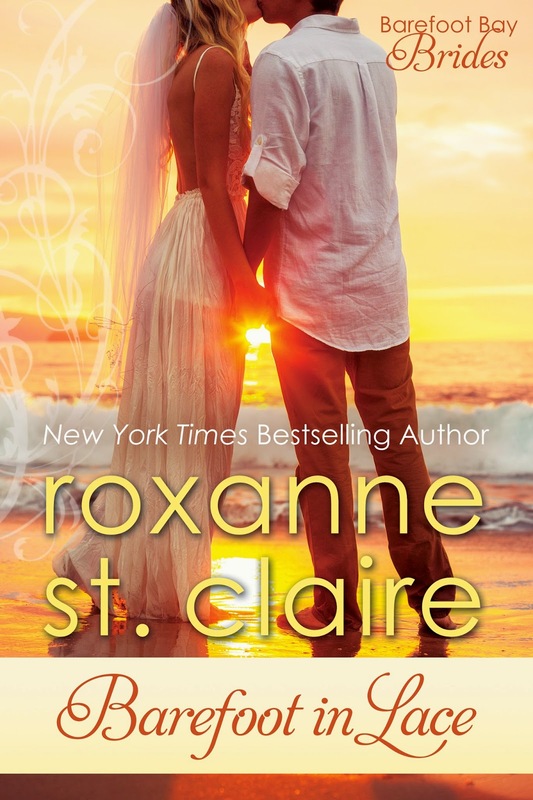 I'm delighted to welcome New York Times and USA Today bestselling and Rita® award winning author Roxanne "Rocki" St. Claire to the blog today. I'm a long-time fan of Rocki's books and, in my opinion, her current Barefoot Bay series is some of her best writing. I highly recommend all of the books in the series. In addition to being a terrific author, Rocki is one of the nicest people around and an author who greatly appreciates her readers. 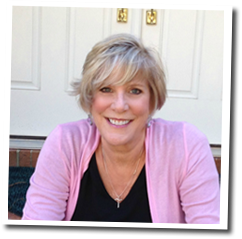 You can find information about Rocki and her books at her website and connect with her online at Facebook and Twitter. Welcome, Rocki! I’ve been enjoying your Barefoot Bay books so much. Each one makes me laugh, makes me cry and touches my heart in a profound way but your newest, Barefoot in Lace- book 2 in the Barefoot Bay Brides trilogy - has set a new standard. In fact, it may just be my favorite of all the books you’ve written. Please tell our readers what they can expect from this book. Wow, thank you! Barefoot in Lace was not an easy, breezy book to write (though I hope it reads that way!) so that compliment means the world to me. Readers can expect a trip back to Barefoot Bay, my fictional island on the Gulf Coast of Florida. Like every book in the series (loosely broken into three “sub” series – the original Barefoot Bay quartet, the Barefoot Bay Billionaires, and the Barefoot Bay Brides), this novel stands completely alone as a romance about two damaged souls who are healed and made whole by love. Readers can expect an emotional ride, some laughs, some tears, plenty of romance, and visits from characters they may already know and love. Oh, and a few lovely chapters in the south of France, just to liven things up a bit! Gussie and Tom are both weighted down by emotional baggage. What is it about these two that convinced you they could overcome their obstacles and find a happy ending together? They “got” each other from the very beginning. These are two people who, on the surface, are not at all what they seem to be. Gussie is a wedding stylist who works for the Barefoot Brides, the destination wedding consultants based in Barefoot Bay, and she longs for a family to replace one she lost when her brother left home years ago. Tom, an elite professional photographer, has experienced exquisite sadness and loss, but has coped by draping himself in a shroud of solitude. When he’s given the guardianship of his twelve-year-old niece, he finds himself in an impossible situation – unable to reach her, unable to leave her, unable to return to his life alone. Enter Gussie, who needs a wedding photographer ASAP, and seems to have a natural rapport with Tom’s niece. They strike a deal, get very close, and begin to peel off layers (and clothes!) to discover…oh, you know. A happy ending! But it’s a tough road to getting there, I promise. A tough road it may be but well worth the journey! I’ve shed a few tears in more than one of your books but this story had me sobbing like a baby. Do you have the same emotional reaction when you write the stories? I’ll be honest – if I don’t shed a tear while writing a book, something is wrong. Yes, I have an emotional reaction. There are two scenes in particular that always make me tear up, no matter how many times I polish and revise – and in the course of writing a book, I can read (and rewrite and revise and improve) a scene at least twenty times!). I’ve been getting a lot of email about those scenes, so I know my reaction matches readers, which is so reassuring! Let’s talk about you a bit. We’re just about to kick off the new fall TV season. What new – or returning -shows are you looking forward to watching? OUTLANDER!!! I am absolutely breathless about the new series on STARZ. I can almost not talk about how amazing it is. I’d never read the book (not a huge historical fan – at least I didn’t think I was) but I heard some buzz about this show and was delighted to discover we actually have STARZ on my TV. (Who knew?) I watched about five minutes and was immediately invested. After the second episode, I bought the book and DEVOURED it. I watch every episode at least twice and each time I’m more blown away by this incredible storytelling. The production is stunning, the acting superb, the writing perfect, and…Jamie. Sam Heughan is all of the above. Like you, I hadn't read the books either but I've fallen in love with the STARZ production of OUTLANDER. It's exquisite! I love to be surprised by characters in the books I read. What would readers be surprised to learn about you? What beautiful photos and how generous of you to share! I’m a huge fan of college football and here in the south, tailgating is an important part of the experience. Let’s say you’re hosting a tailgating party and can invite ten couples from your books, who would you choose and why? What favorite dishes would you serve? Well, first of all, it would not be a tailgate party and it might not be a football game. I’m not really a fan (though I am a Gator Mom and there are fans around me) but we love to host barbeques – and that counts as a southern tradition, right? I would be tempted to invite all of the Bullet Catchers and their beloveds (there were eleven books in that series, so we’d have to make room for an extra couple and, by now, a few babies). That way, we could PLAY football (there’s often a game of touch football at Lucy Sharpe’s estate on Sundays, readers may recall) and admire teams up close and personal. There are TEN Barefoot Bay books (or will be when the third in the Barefoot Brides comes out early next year) so that would make a very fun party, too. On the beach and barefoot, of course! Barbeques work just fine and I love the thought of all the Bullet Catchers back together! As you mentioned above, the third book in the Barefoot Bay Brides trilogy will be out next year. Will you be returning to Barefoot Bay after that? I admit, it’s become one of my favorite fictional places to visit! Thank you so much – you are always welcome to kick off your shoes and fall in love! Barefoot Bay is constantly growing – there’s a minor league baseball team moving in, you know. And some excitement brewing off shore that could make a splash, too. I’m definitely writing another trilogy set in Barefoot Bay, and am just now starting to plan out those books for 2015. Stay tuned!! Thanks so much for visiting with us today, Rocki. Would you like to ask our readers a question? YES! I am considering adding a little suspense and intrigue to my contemporary romances. Not a lot of dead bodies or darkness, I assure you, but more like a romantic adventure with a bit of danger to balance out the drama. I’m thinking a touch of mystery layered into the love story, but with the core story focused on the developing romance. Is this something contemporary readers like? Please give me your opinion, and one winner will get print copies of BAREFOOT IN WHITE and BAREFOOT IN LACE! Good morning. Would love to win this prize. I've read both books. They're wonderful! I did enjoy your earlier work with the hurricane danger. I like the romance aspect more than intrigue but I know you will do a great job of incorporating both in your book. I do not like gore. I'd read it. I would treasure autographed copies of your two books BAREFOOT IN WHITE and BAREFOOT IN LACE! I'm kind of wimpy when it comes to gore too but I love romantic suspense. Rocki's Bullet Catchers are all on my romantic suspense keeper shelf. I haven't yet read your books (but I work with PJ and she recently asked me if I read "Rocki's" books--so I know she must have just read this book because she was crazy excited to talk about it. It sounds wonderful!) I definitely will have to seek them out. I like a nice suspenseful adventure, but not always into the dead bodies things. But if it's "done right", with enough wit and humor and zippy one-liners as well as the emotional punch you seem to have in spades, I'll likely read it. I used to never read Nora Roberts (I know! What was wrong with me?) but then I read one...then another...and then I glommed a series I adored...and now I'm reading Carolina Moon, and it's contemporary with some suspense/dead bodies and I love it. Wouldn't normally read it on a bet. It's not so much what a writer writes, but the voice of the writer than lures me into their stories. You make an excellent point, jcp. Sometimes I want a romantic suspense and other times I'm in the market for straight contemporary. It's good to know ahead of time what we're picking up. I think some intrigue would be an added bonus along with the normal story line. I like variety and that would change it up some but the characters always come first! Right there with you, catslady. It's all about the characters! I'd like some intrigue in the story. I frequently find (and enjoy) a bit of mystery incorporated in the historical romances I read. But I am a fan of romantic suspense and mysteries, so I may be a bit biased! Thanks for visiting, Rocki. Intrigue and romance go hand in hand.. I love when a story has mystery or suspense mixed in. Give the story a little more scintillating. Intrigue makes the story captivating. I enjoy the mystery and and romantic suspense greatly. Contemporary are very appealing. I have read your books which are enthralling. Characters whose lives are involved with trials and tribulations and relationships that are fragile are interesting. Forgot to answer your question; sorry - I do like a little danger or suspense in my romance stories. Definitely!!! I like the rom com but romantic suspense was my gate way and is near and dear to my heart :) Congrats on the new release! I do like a contemp romance book with suspense sometimes. As long as it is not dark or sadistic. Yes I do enjoy reading a book with some element of suspense or danger. I love your books... yes add suspense to your books...I love those.. I don't generally gravitate to mystery & danger, but if the love story is strong & central, I could go for it! I don't read a lot of mystery but this sounds pretty interesting. I do love when a romance, contemporary or historical, has some suspense mixed in - as long as it is done well. I know you would do an excellent job of it, Roxanne! Yes, yes! I love some suspense with my romance!! Love your books, they are great. A hint of danger & adventure sounds fantastic. I love your books Roxanne, and I think adding suspense and intrigue into your books will be fantastic as well. Love the "Barefoot Bay" books. I actually like some suspense in books, but I mostly read to relax. I can see somehow combining the suspense characters with the Barefoot Bay characters. I see it somehow based on the baseball team and the billionaires! I think it would be fun! I find good suspense harder and harder to find. I loved Rocki's Bullet Catchers and Guardian Angelinos. I've read all the Barefoot Bay books and I don't know how she can top Barefoot in Lace, but I can't wait to find out! Roxanne has such delightful characters, and I have to admit that I really do love this series of hers from the other series she has. They are so fun and yet sweet. I could take a little bit of mystery in Barefoot Bay, but not a lot. I love the romance of this series so much. Enjoy reading books with some suspense, and mystery. But so far you haven't let me down in your books.